SIRIUS Satellite Radio and XM Satellite Radio have completed their merger, resulting in the nation's premier radio company. The new company plans to change its corporate name to SIRIUS XM Radio Inc. The combined company's stock will continue to be traded on the Nasdaq Global Select Market under the symbol "SIRI." SIRIUS XM Radio begins day one with over 18.5 million subscribers, making it the second-largest radio company, based upon revenue, in the country; and, based upon subscribers, the second largest subscription media business in the U.S. With under 10% penetration of the home and car market, the opportunity for continued growth is significant. "I am delighted to announce the completion of this exciting merger between SIRIUS and XM," said Mel Karmazin, CEO of SIRIUS XM Radio. "We have worked diligently to close this transaction and we look forward to integrating our best-in-class management teams and operations so we can begin delivering on our promise of more choices and lower prices for subscribers." "Every one of our constituencies is a winner. Combined, SIRIUS XM Radio will deliver superior value to our shareholders. By offering more compelling packages and the best content in audio entertainment, we are well positioned for increased subscriber growth. Our laser focus on subscribers will continue and listeners can be assured that there will be no disruption in service. We also believe that the completion of the merger will eliminate any confusion that has been lingering in the marketplace," added Karmazin. XM shareholders will receive 4.6 shares of SIRIUS common stock for each share of XM. SIRIUS XM Radio broadcasts more than 300 channels of programming, including exclusive radio offerings from Howard Stern, Oprah, Opie & Anthony and Martha Stewart, among others. SIRIUS XM Radio will offer these expanded options to consumers through arrangements with the world's leading automakers and its relationships with nationwide retailers. As a result of the merger, SIRIUS XM Radio will also be able to offer consumers new packages, including the first-ever a la carte programming option in subscription media. In addition to two a la carte options, the new packages will include: "Best of Both," giving subscribers the option to access certain programming from the other network; discounted Family Friendly packages; and tailored packages including "Mostly Music" and "News, Talk and Sports." The first of the new packages will be available in the early Fall. "One of the most exciting benefits of this transaction is the ability to offer subscribers the option of expanding their subscriptions to include the Best of Both services. Given the respective popularity of exclusive programming on both SIRIUS and XM, we expect many subscribers will upgrade their current subscription," said Karmazin. "The upside potential for both consumers and shareholders is huge. Consumers have the ease of adding premier programming without purchasing a new device. For shareholders, this kind of organic growth is a key part of the company's future and the success we expect to see," said Karmazin. As promised when the merger was first announced, existing radios will continue to work and every subscriber has the option of maintaining their current service package. SIRIUS XM Radio expects to begin realizing the synergies expected from this transaction immediately. "In addition to realizing significant potential revenue growth, the management team will move quickly to capitalize on the synergies that many analysts have predicted for this combination. We expect to begin achieving those synergies without sacrificing any of the world-class programming and marketing we are known for," said Karmazin. The company today also reiterated guidance for the combined SIRIUS XM Radio. Based upon a preliminary analysis, the combined company expects to realize total synergies, net of the costs to achieve such synergies, of approximately $400 million in 2009; to post adjusted EBITDA exceeding $300 million in 2009; and to achieve positive free cash flow, before satellite capital expenditures, for the full year 2009. The company also expects that both synergies and adjusted EBITDA will continue growing beyond 2009. "We have all the tools necessary to begin executing as a combined company with high aspirations for subscriber growth and greater financial performance in part from the significant synergies that we begin realizing literally today -- on Day One. We are moving quickly to integrate the operations," said Karmazin. The corporate headquarters will be located in New York, NY and XM Satellite Radio, the company's wholly-owned subsidiary, will remain headquartered in Washington, DC. Fairlee, Vermont's Troy Gray earned a soggy $2,000 check at Thunder Road International Speedbowl Sunday night, outlasting more than 100 other drivers -- including Sirius Speedway's own Dave Moody -- to win the 24th Annual M&M Beverage Enduro 200. The race was truly a survival-of-the-fittest ordeal, featuring a half-hour rain storm that failed to elict a caution flag from track officials, two rollovers, a couple of small fires and more twisted sheetmetal than Kyle Busch's backyard. Gray drove a 1995 Mitsubishi Eclipse to the checkered flag, besting runnerup Rory Partlow of Northfield in a thoroughly rusted 1996 Chevy Corsica. As for your humble "Godfather," he soldiered on through three flat tires, a pair of wild spins, numerous minor collisions and a sometimes-balky electrical system to unofficially finish 16th, completing 180 of the 200 laps. "Other than not being able to see through the oil, grease and water smeared across my windshield, dealing with an incredibly slick racetrack and dodging a few dozen homocidal maniacs, it was pretty easy," laughed Moody at race's end. "There's not much left of the car, but we drove it on the trailer at the end of the night, and that was my goal!" What The #@$% Happened At The Brickyard? You've got questions, but we don't necessary have answers. At least not yet. In the aftermath of a race at Indianapolis Motor Speedway that can best be described as a debacle, both NASCAR and Goodyear are scrambling today, trying to figure out what went so terribly wrong. For those fortunate enough to have been undergoing root canal surgery yesterday -- with or without anesthesia -- Jimmie Johnson won the AllState 400 at The Brickyard, outrunning Carl Edwards and the rest of the Sprint Cup Series pack in the final laps of a race that featured less excitement than a Girl Scout taffy pull, and more explosions than "Die Hard With A Vengeance." 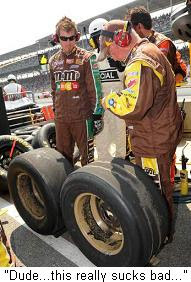 It's not the first time NASCAR and Goodyear have struggled with tires. In fact, it's not even the first time at Indy. Indianapolis Motor Speedway is similar in some ways to Atlanta, where NASCAR experienced tire trouble earlier this year. Both tracks are very fast, and extremely rough. IMS officials ground the corners of the racetrack in 2002, in an effort to improve grip for the Open Wheel Indy Cars. That made the track extremely abrasive, dramatically increasing tire wear. Fortunately, that tire wear was generally confined to practice and the early laps of the race itself. As more laps were turned, the grooves in the asphalt became filled with rubber, and tire wear improved. Unfortunately, that did not happen this year. The question is, why? The answer appears to lie in the interplay between NASCAR’s new racecar and the specific tire Goodyear brought to Indianapolis Motor Speedway. The new car has a much higher center of gravity, and transfers as much as 100 additional pounds to each of the right-side tires. In addition, it appears that Goodyear’s specific tire compound for Sunday’s race never allowed the track to “rubber up.” A number of teams reported that instead of producing “marbles” – chunks of rubber that wear off the tire and are ground into the asphalt – this year’s tire wore into a fine powder that failed to adhere to the racing surface. Sirius Speedway contributor Diandra Leslie-Pelecky writes at StockCarScience.com that “the different manner in which the tread wore… suggests that there was a problem with either the nature of the tread compound used, or with the tire processing.” However, she points out that the compound used Sunday is identical to that used a year ago, when there were no major issues after the early laps of the race. This year, NASCAR was forced to mandate a series of competition cautions every 10-11 laps. There were six competition cautions in all, forcing 52 of the race’s 160 laps – roughly one-third of the event -- to be run under the yellow flag caution. That’s a bad deal for everyone involved. · A relatively flat track, with high speeds and an extremely abrasive surface. · A new car with a comparatively high roll center that put added stress on right-side tires. · A tire compound and construction that is used at no other track but Indy. · A pre-race tire test that included only three cars, instead of a full-bore, open test. Goodyear Director of Race Tire Sales Greg Stucker stated the obvious after the race, saying, “The tread wear didn't improve as we thought it would over the course of the afternoon. We don't have the answer as to why that didn't happen, so we've got to go back …and try to figure out how to make it better. I don't think anyone likes to race like this — us included. We're going to try to figure out what we need to do to make it better." Clearly, Goodyear misjudged the amount of stress that the new car would place on right-side tires. NASCAR erred as well, by electing to conduct only a three-car tire test in advance of the race. That two-day April test -- involving drivers Kurt Busch, Brian Vickers and Dale Earnhardt Jr. -- clearly did not provide Goodyear engineers with sufficient data to build an acceptable tire for Sunday’s race; a mistake that will certainly be addressed before the NASCAR Sprint Cup Series returns to the Brickyard next season. That doesn’t do anything to placate fans who suffered through one of the worst races in modern memory yesterday, and it does nothing to counteract TV ratings that almost certainly plummeted as the afternoon wore on. At this point, it’s little more than crying over spilled milk. NASCAR and Goodyear will have to take their respective lumps from a disgruntled public, while making plans for a comprehensive tire test before next year’s race to prevent something like this from ever happening again. Even after all these years, there’s apparently still no shortage of bad blood between Rusty Wallace and Ryan Newman. It bubbled to the surface again late last week, when Wallace claimed Newman was fired recently by team owner Roger Penske. The former Sprint Cup Series champion claims Penske is angry with Newman’s recent criticism of the team, which has plummeted to 16th place in championship points after winning the season-opening Daytona 500. "I talked to Roger and he didn't like... all the negative stuff. Roger doesn't like anybody telling him his equipment is junk,” Wallace said. "Ryan and I never got along real well, that's for sure. We hyped forever and ever how (Newman) is an engineer… (but)they can't get that car figured out. Told of Wallace’s comments, Newman scoffed, "Was he conscious when he said it? It doesn't matter to me. I know Rusty and his personalities - plural - and everybody is different. I don't know what Rusty's grounds are, or what he's trying to prove by saying that, (but) it wasn't the case, point-blank. Roger and I decided mutually not to continue, and it was more of my decision than it was his." Newman admitted talking plainly to Penske about what he sees as the shortcomings of the #12 team, saying such honesty is part of any successful operation. "Nobody likes to be criticized as a driver, nobody likes to be criticized as an owner, but constructive criticism is part of what I have to do as a driver," he said. "If I don't feel like I have good equipment -- or as good equipment as the guy who is ahead of me -- then I speak up. "You have to be able to stomach a percentage of that, whether you're a car owner or a crewchief or a guy changing tires. That's part of it. And I would expect the same thing in return." 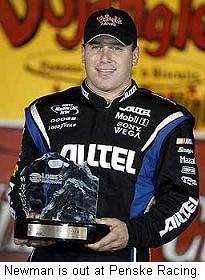 Sam Hornish Jr. said yesterday that nobody has spoken to him about moving from Penske Racing’s No. 77 Dodge to replace the departing Ryan Newman next season, and that he has no idea who will ultimately end up in the ride. Sources close to the situation continue to tell Sirius Speedway that David Stremme is the leading candidate for the ride, but whether or not those sources are correct, it seems likely that Stremme will find his way back to the Sprint Cup ranks next season, one way or another. Stremme has turned down a number of offers to return to the Sprint Cup Series this season -- holding out for a ride that he feels is capable of running up front -- while serving as a test driver for Penske Racing. All three Penske drivers -- Newman, Kurt Busch and Hornish -- have praised his work, as has Penske himself. When Dario Franchitti broke his ankle at Talladega this spring, Stremme was allowed to fill-in for only a single race, despite being offered a longer deal by Ganassi Racing. Most drivers in Stremme’s position have an “out clause” in their contract, allowing them to leave if a quality Cup ride becomes available. The lack of such a clause in Stremme’s contract – or at least his unwillingness to exercise it -- leads me to believe that he has job security at Penske that goes well beyond his current status as a test pilot. In short, I believe that Stremme may have already received a committment from Roger Penske for a full-time Cup ride in 2009. Yet another option for career advancement landed on Stremme’s doorstep yesterday, when an executive for ABC/ESPN confirmed that Rusty Wallace could continue as a network analyst if he moves his race team to the NASCAR Sprint Cup Series. Wallace has not yet commented publically on the possibility of RWI jumping to Cup in the near future. But if he does, Stremme will obviously be at the top of his list of potential drivers. Kevin Harvick turned his weekend off from Sprint Cup competition into a paid vacation yesterday, winning the 35th annual TD Banknorth 250 at Maine’s Oxford Plains Speedway. 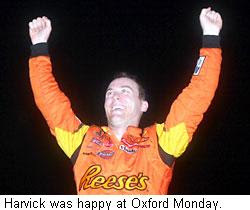 Harvick dominated the second half of the event that was postponed by rain Sunday, besting Oxford Late Model regular Glen Luce and 19-year old Joey Polewarczyk Jr. to cash a $37,200 winner’s check. He took over from early leader Eddie MacDonald on a lap 126 restart, gave the lead back by a fender six laps later, then held off a late charge by Luce to claim the win. You can check out the complete finish by clicking HERE. Penalty Upheld: The National Stock Car Racing Commission has denied a Dale Earnhardt Inc. appeal of the penalties levied by NASCAR to Martin Truex, Jr.s team for infractions during Coke Zero 400 weekend at Daytona International Speedway. DEI officials had no comment on the commission's ruling. They still have the right to appeal the decision to the National Stock Car Racing Commissioner, but Manion and Putnam will begin serving their suspensions this weekend at Indianapolis Motor Speedway. Terry Continues: Kyle Petty's midseason break will be extended for at least one more week. Petty’s job as an analyst for TNT ended last weekend, but replacement driver Terry Labonte will be in the car again Sunday at the Brickyard. Spokesmen for the team say the move is to ensure that the #45 Dodge will be in the field Sunday -- since Labonte has a Past Champion's Provisional at his disposal – and is only temporary. Petty is expected to return to the car, most likely in two weeks at Pocono. He has an average finish of 34.3 this season, while Labonte has recorded an average finish of 27.5 in his six replacement races. More details are coming to light on Stewart-Haas Motorsports’ plans for 2009. On last night’s edition of Tony Stewart Live on Sirius NASCAR Radio last night, Stewart said there are no plans for a third – or even a fourth – car next season, saying, “right now we're going to concentrate on getting these two Cup cars exactly where they need to be… before we expand." Published reports say that Stewart has finalized plans to drive the #14 next season, with sponsorship from Old Spice and Office Depot, with an official announcement coming Friday at Indianapolis Motor Speedway. The United States Patent and Trademark Office confirms that team General Manager Joe Custer applied for a trademark for the number on July 2nd. ChiTown Ratings Dip: TNT's final Sprint Cup Series broadcast of the season experienced a significant drop in ratings from last season, due in part to a move from Sunday afternoon to Saturday night. The Chicagoland Speedway race received a 3.7 rating, down 23 percent from the 4.8 it received a year ago. In addition, the previous night’s Nationwide Series race received a 1.6 rating on ESPN, down from the previous year’s 1.9 Saturday afternoon rating on ABC. For only the third time in its history -- and the first in 22 years -- the legendary TD Banknorth 250 at Maine's Oxford Plains Speedway fell victim to rain Sunday, and was rescheduled for 2 p.m. today. Steady rain delayed the start of qualifying by more than three hours, and interrupted the festivities on three different occasions before a heavy downpour -- and a radar screen filled with ominous color -- forced promoter Bill Ryan to pull the plug. 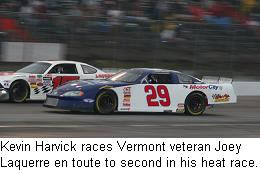 A total of 87 Late Model drivers from six states and two Canadian provinces were on hand for the $25,000-to-win event, including NASCAR Sprint Cup Series star Kevin Harvick, who qualified second in his heat race behind Maine native Carey Martin. Harvick says he'll be back for Monday's rescheduled race, though wife/boss Delana has decreed that most of his KHI crew will return to North Carolina Monday morning to return to work. Sirius Speedway host Dave Moody was similarly unfortunate, as family commitments will force him to miss Monday's race, after spending the entire day Sunday dodging raindrops and renewing old friendships in the OPS pit area. Sirius NASCAR Radio colleague Matt Yocum was also crying the blues last night, since his duties as co-host of Tony Stewart Live will force him to return home Monday and miss the rescheduled race. Today's program will include the sixth and final 20-lap heat race, plus three consolation events, the Last Chance race, a pair of support division features and the 250-lap main event. The Montgomery (AL) Board of Adjustment met as scheduled last night, and the end result of that meeting is that the sale of Montgomery Motor Speedway is now on hold. NASCAR Craftsman Truck Series driver Rick Crawford wants to purchase the 63-acre track, but needs a racing permit from the board before the deal can go through. A handful of local homeowners have hired an attorney to block Crawford’s request permit request, arguing that the track is located on a flood plain, and that a recent three-year shutdown cost the track its grandfathered status as an existing use facility. Last night’s meeting was contentious at times, with supporters on both sides of the debate packing the City Council chamber. At the end of the evening, board members approved a motion requiring Crawford and the landowners to try to resolve several key issues. The track purchase must be completed by July 31, however, making the timeline for negotiations extremely short. 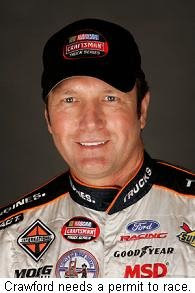 Crawford said his NASCAR Craftsman Truck Series schedule will make it difficult for him to meet with the homeowners within the next two weeks, meaning that even if a compromise can be reached, it will cannot be presented to the board until its next meeting on Aug. 21. Both Crawford and track owner Bill Manfull say they are willing to push back the closing date, if necesary. Crawford said, "I'm going to try and get this resolved and work with everyone to get the place opened back up. This is my dream, and I'm going to keep trying." Attorney Doyle Fuller, who represents the landowners, was less optimistic, saying, "There's nothing they can do about the noise and the traffic out there. We'll be happy to talk with Mr. Crawford, but I don't know how much we'll be willing to do." 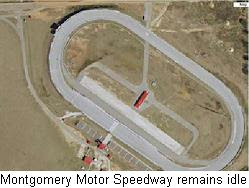 The Montgomery (AL) Board of Adjustment meets tonight, and when it is all over, there’s a decent chance that NASCAR Craftsman Truck Series driver -- and American Cultural Icon -- Rick Crawford will be told that he didn’t really purchase Montgomery Motor Speedway last month, he purchased a 63-acre parking lot. Crawford goes before the board tonight to ask that they grant him a license to hold racing events at the Speedway this season, but thanks to a few local homeowners and their attorney, that request may be denied. Local attorney Doyle Fuller represents the homeowners, and says Montgomery Motor Speedway is now located on a floodplain. How can a track has been in existence since 1953 suddenly find itself in a floodplain? Well, apparently it’s been there all along, causing no problem at all. Despite that, the honorable Mr. Fuller is determined to see that the track never opens again. In his words, “There are only so many structures you can put in an area like that, and we don't believe a racetrack is one of them." According to Fuller, the track was operational when the area was first declared a floodplain, and was "grandfathered in" as an existing use facility. But when track owner Bill Manfull shut the speedway down three years ago, Fuller and his clients say he forfeited the track’s grandfathered status. He is demanding that the board treat Montgomery Motor Speedway as a new facility, and deny Crawford a permit to hold races there ever again. Manfull isn’t going quietly, though. He points out that the law requires only that one race be held each year to maintain the track’s operational status. And he contends that he has met that obligation. He says he personally raced school buses and rental cars around the facility in each of the last three years, while leasing it to Hyundai as a parking lot for newly produced automobiles. He told the Montgomery Advertiser, “All of that's racing. Nowhere does it say we've got to have a certain number of participants, or fans watching. (It) just says we have to have a race per year. We've done that." So tonight, the Montgomery Board of Adjustment has a choice to make. They can knuckle under to the legal maneuvering of a small group of people who bought houses next door to a racetrack, without ever considering the possibility of actual racing. Or they can allow Rick Crawford to try and turn a rundown piece of undeveloped property into something the area can once again be proud of. The dominoes continue to fall in place for next season, after Penske Racing and Ryan Newman announced today that they have agreed to go their separate ways in 2009. He added that a new driver for the No. 12 Dodge will be announced in the near future. The Indiana native said Saturday that he has three options to consider -- other than remaining at Penske -- and that ownership is part of at least one of those options. He declined to comment on last week’s Sirius Speedway report that he will join fellow Hoosier Tony Stewart at Stewart-Haas Racing next season, though sources now say that the deal is done and ready to be announced; most likely next weekend at Indianapolis Motor Speedway. Newman said last month that he would not sign a new contract with Penske unless the team made significant improvements in performance. He is currently 16th in points after a tenth place finish Saturday night at Chicagoland Speedway. Testing 1-2-3: NASCAR submitted a proposed 2009 testing policy to its teams Saturday night at Chicagoland, calling for 24 test days per team at tracks where the Sprint Cup Series competes. Each team would be allowed a maximum of two cars per test, with all of the team’s drivers able to test. No driver will be allowed to test for a team other than his own. The proposal also includes a one-week “blackout period” prior to each race, and an offseason testing ban from November 1 through January 15; not including the regularly schedule Daytona preseason tests. NASCAR will seek input and feedback from the teams before finalizing the new policy. Joe Gibbs Racing and Tony Stewart made it official this morning, with an announcement that they have agreed to part ways at the end of this year. Stewart will finish the 2008 season in JGR’s No. 20 Home Depot Toyota, and also run two more NASCAR Nationwide Series races for them, before moving on to other ventures in 2009. His next ride is expected to be with Haas-CNC Racing as an owner-driver, with sponsorship from Old Spice and Office Depot. Stewart also said that his longtime crewchief, Greg Zipadelli, will not accompany him to his new team, ending the longest active driver/crew chief relationship in NASCAR Sprint Cup racing. A formal announcement of Stewart’s future plans will take place tomorrow at 1:30 p.m. CT in the Infield Media Center at Chicagoland Speedway. Multiple reports today have said that Stewart was “granted his release” by JGR. Nothing could be further from the truth. Stewart bought out the final year of his contact with the financial assistance of General Motors and Chevrolet, and I’m told that the buyout did not come cheap. After all, JGR held all the cards in that particular negoatiation. Technically, they could have put Joey Logano in the #20 Toyota next season, paid Tony his salary and forced him to sit on the sidelines for all of 2009; effectvely scuttling all the sponsorship plans he has so painstakingly put in place over the last few weeks. Elledge To RBR: Red Bull Racing announced today that veteran crewchief Jimmy Elledge will replace Ricky Viers atop the pitbox for the #84 Toyota piloted by AJ Allmendinger, beginning this weekend at Chicagoland Speedway. 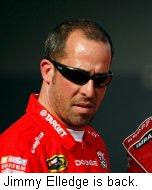 Elledge was released as crewchief of Juan Pablo Montoya’s Chip Ganassi Racing Dodge a few weeks ago, and has previously worked with drivers Casey Mears, Reed Sorenson, Kenny Wallace, Bobby Hamilton and Dale Jarrett. There is no word on Viers’ plans for the future, or if he will remain with the team in another capacity. Franchitti Back In Chi-Town: Dario Franchitti will replace Brian Clauson in Chip Ganassi Racing’s #40 Fastenal Dodge in Friday night’s NASCAR Nationwide Series Camping World 300 at Chicagoland Speedway. Clauson’s entry was withdrawn late Tuesday afternoon, with Franchitti listed as a replacement. After shutting down Franchitti’s Sprint Cup operation last week, Ganassi said he had offered to put the Scotsman in the Nationwide car for the balance of he season. Franchitti said Sunday that he would meet with Ganassi this week before making a decision. 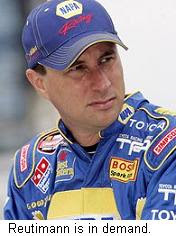 Reutimann Has Options: Published reports today have David Reutimann leaving Michael Waltrip Racing to replace Kyle Petty in the Petty Enterprises #45 Dodge next season. There has been no comment from any of the involved parties, and I will say only what I have said for a number of weeks; that David Reutimann is well-regarded by a number of teams in the Sprint Cup garage, and does not lack for options. Sirius NASCAR Radio's Sirius Speedway is reporting today that Teresa Earnhardt has enlisted the services of Bear, Stearns and Company to find a buyer -- or at least a major financial investor -- for Dale Earnhardt, Inc. Bear Stearns is an investment bank, securities trading and brokerage firm based in New York City, and has been charged with finding a buyer for the entire operation. Barring that, Earnhardt is said to be interested in selling at least a minority interest in the team. DEI President of Global Operations Max Siegel declined to comment on the story when contacted earlier today. DEI finds itself at a competitive crossroads, with Mark Martin leaving the team at season's end for a new ride with Hendrick Motorsports. Martin Truex Jr. is unhappy with the recent performance of his Bass Pro Shops-sponsored Chevrolet, and has not yet signed the contract extension team officials announced more than four months ago. He currently ranks 14th in championship points, but is likely to fall further behind when NASCAR announces penalties this week for the roofline violation found on Truex's car in opening inspection at Daytona. Team officials admitted last week that they may be forced to trim their roster by one next season if sponsorship cannot be found for Regan Smith's #01 Chevrolet, and reports have surfaced that Paul Menard may also be shopping around his Menard's sponsorship for next season. DEI President of Global Operations Max Siegel declined to comment on the story earlier today. While the future of DEI appears uncertain, many of the other driver/sponsor dominoes are beginning to fall into place. 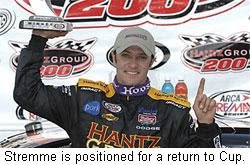 Tony Stewart is expected to announce a 2009 move to Haas-CNC Racing at Indianapolis Motor Speedway in three weeks. Reliable sources tell Sirius Speedway that Stewart will also announce sponsorship from Office Depot and Old Spice as part of a new, multi-year package with Haas CNC, and that Penske Racing’s Ryan Newman will join him as a teammate, with sponsorship from Jack Daniels. That surprise move comes as the result of an enviable situation at Richard Childress Racing, which now has five potential sponsors for next season, and only four teams. Sirius Speedway has learned that UPS will move from Michael Waltrip Racing’s #44 Toyota to the quarterpanels of Clint Bowyer’s #07 Richard Childress Racing Chevrolet in 2009, leaving Jack Daniels in search of a new driver. That driver will be Newman, who is set to sign-on with Stewart at Haas CNC after a difficult 2008 season littered with mechanical failures and poor performance. It appears to be a two-man race for Newman’s soon-to-be-vacant seat at Penske Racing, with Casey Mears and David Stremme in the running. The Mears-Penske connection is well established, with Casey’s uncle, Rick Mears, winning multiple Indianapolis 500 titles with car owner Roger Penske. Stremme, however, is making a strong bid for the ride, doing yeoman work as Penske Racing’s test driver this season. 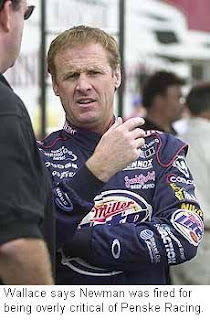 He also stands ninth in NASCAR Nationwide Series points for Rusty Wallace, Inc., despite starting only 16 of 17 races. In fact, Stremme’s name is being linked with as many as three different Cup openings next year. While Stewart’s Indy announcement will help to solidify the driver/team lineup for 2009, there are still a number of questions looming over the Sprint Cup Series garage. Scott Riggs and Johnny Sauter will presumably be looking for new rides once Stewart and Newman set up shop at Haas CNC Racing. Truex remains questionable for a return to DEI. David Reutimann, Reed Sorenson, David Ragan, Paul Menard and Dave Blaney are all in the final year of their respective contracts, though Roush Fenway Racing confirmed this weekend that Ragan will return in 2009. 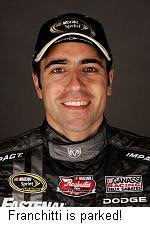 Dario Franchitti’s NASCAR career is currently on hold, after his #40 Chip Ganassi Racing Dodge was parked for lack of sponsorship last week. It looks like Silly Season may drag on a bit longer, after all. More than 70 team members found themselves on the unemployment line last week when Chip Ganassi parked Dario Franchitti’s Dodge due to lack of sponsorship. Word around the NASCAR garage is that another 30 may soon follow. Multiple Ganassi team members spoke off the record Saturday at Daytona International Speedway, revealing that some of last week’s layoffs involved longtime employees who predated Ganassi’s purchase of the team from Felix Sabates in 2001. 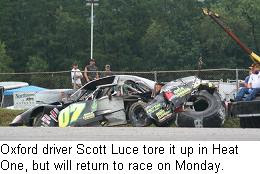 In addition, many of those laid off were members the Reed Sorenson and Juan Pablo Montoya teams, who saw their jobs taken by former Franchitti crewmen. The layoffs prompted harsh words and hard feelings, and team management reportedly brought in nearly a dozen police officers to maintain order before announcing the moves. The cuts deepened what sources say was already an “us against them” mentality within the three-car operation, and has plunged morale to an all-time low. Ganassi has offered Franchitti a full-time Nationwide Series ride for the remainder of the season, but the Scotsman has yet to sat whether he will accept that offer. Light On The Horizon: There may be help on the way for Yates Racing. Jack Roush said this weekend that sponsorship is imminent for fellow Ford team owner Doug Yates; enough to allow him to expand his operation to three cars next season. Despite working with limited sponsorship, Yates currently has two teams in the Top-25. Travis Kvapil is 20th in championship points, and David Gilliland ranks 22nd. No word on who might drive a third Yates Ford next season. Chevy Will Stay: General Motors Corporation’s NASCAR Program Manager said this weekend that while times are indeed tough in the automotive business, Chevrolet has no plans to pull out of NASCAR, or even reduce its funding. Alba Colon said that contrary to at least one published report, she expects GM to level-fund its NASCAR operations in 2009, with no reductions from this year. She declined to comment on reports that GM will eliminate its track and race event sponsorships next season, and sources tell Sirius Speedway that while some cuts are possible, negotiations for next season are continuing and reports of a full-scale pullout are premature. Chip Ganassi Racing with Felix Sabates announced today that due to a lack of sponsorship, it will cease operation of the No. 40 NASCAR Sprint Cup Dodge driven by Dario Franchitti, beginning this weekend in Daytona. Ganassi said he is committed to Franchitti’s continued stockcar development, and is talking with him about options for the future, including the possibility of running the balance of the season in the No. 40 Fastenal Dodge on the NASCAR Nationwide Series. The move will reportedly have no effect on the Juan Pablo Montoya or Reed Sorenson teams. Dale Earnhardt Inc. is expected to announce today that Aric Almirola will drive the No. 8 Chevrolet full-time next season, opening the door for Mark Martin to move to the #5 Chevrolet at Hendrick Motorsports. 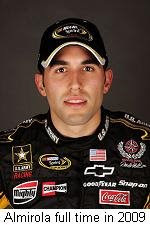 Team officials decided to promote Almirola to full-time competition because he has developed a good rapport with crewchief Tony Gibson, and because the 24-year old is a better demographic fit for the team’s U.S. Army sponsorship. Sirius Speedway reported two weeks ago that the Army is considering its options for 2009, and could leave DEI for another team. Elevating Almirola to full-time status could bolster DEI’s hopes of retaining the Army sponsorship for another year. Initially, Almirola’s promotion was believed to be a result of Mark Martin’s decision to move to Hendrick next season. However, it now appears that the opposite was true. DEI reportedly told Martin during All-Star week at Lowe’s Motor Speedway that they had decided to run Almirola full-time in 2009, leaving the Arkansas veteran without a ride. Martin immediately began searching for another opening, and found one at Hendrick Motorsports. He has been unavailable for comment, but is expected to announce his new ride later this week at Daytona International Speedway.